Spend the day learning the basics of weaving on a portable Knitter's Loom. Play with beautiful yarns and colours, meet new friends, and create a one-of-a-kind scarf. 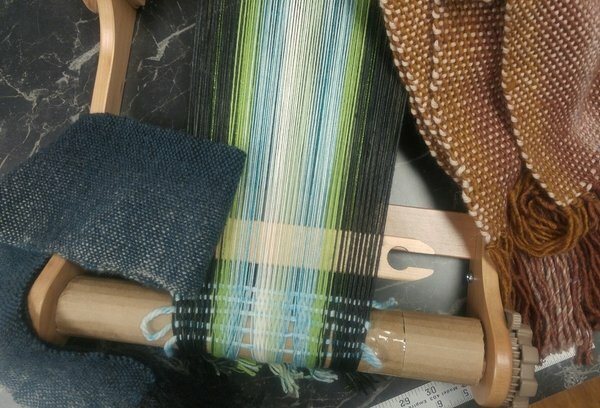 This class is guaranteed to inspire you to learn more about weaving. You will need about 200 meters total of worsted weight yarn(s). The yarn needs to be smooth and even. No lumps, bumps, or fuzzy textures. The yarn may be multi coloured. Assistance selecting yarn for your scarf can be done in shop prior to class or the day of class.